Chicco's tableware range is designed to help mothers in teaching their kids the art of eating independently at an early age. 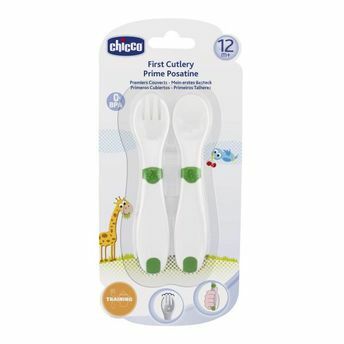 Thanks to its ergonomic handle with non-slip inserts, the first cutlery set is ideal for self-feeding in the most efficient and easy way. The specific shape of the tip allows to introduce into the baby's mouth the right quantity of meal and to respect the baby's growth. The shape of this fork has been studied to help the baby to learn how to use a fork without any trouble, in complete safety.